After the successful sale of the Vérité collection last year, I’m very proud to present another collection sale at Christie’s Paris. 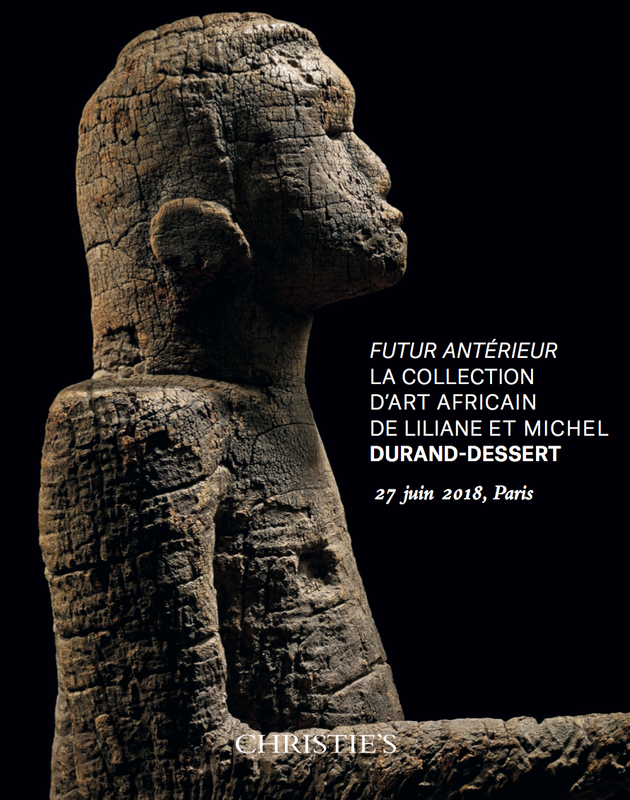 On 27 June, we’ll be offering the famous African art collection of Liliane and Michel Durand-Dessert. You can browse the catalogue HERE. The 105 treasures (with a combined estimate of € 7-10 million) are a testament of the avant-garde taste of the Durand-Dessert couple, pioneer gallerists of contemporary art, who have taken an innovative look at African arts, to form a collection which they have brought together with love and rigour for more than thirty years. The dispersion of this important ensemble constitutes a major event for the African art market, not only because of the intrinsic quality of the objects that are part of it, but because of the uncommon personalities of the couple that put it together with an unrelentingly critical, analytical and original approach, in which their high standards are clearly discernible. Open without exception to all areas of African art, this group was meticulously build up by the couple as a couple. Both are brilliant literary and scientifc academics, and audacious cutting-edge gallery owners who have been pioneers in their field, having shown the most radical 20th century avant-garde art. Also the choices they made in their collecting were well ahead of the pack – the arts of Nigeria indeed form a crucial segment of this unique collection. In 2008, an important selection of it was presented at the Monnaie de Paris during Parcours des Mondes. This highly acclaimed exhibition, Fragments du Vivant (‘Fragments of the Living’), put their collection on the map and was accompanied by an excellent catalogue published under the supervision of Jean-Louis Paudrat and with beautiful photographs by Hughes Dubois. As you’ll note, many excerpts from the introductory interview published in this book enrich our catalogue notes, inasmuch as the eyes and appreciation that these collectors have had for their objects have contributed so much to making them the marvels that they are. The African art collection Liliane and Michel Durand-Dessert was born from the same implacable passion that animated their visionary choices for their gallery. A short history of the collection and its makers in English can be found at the back of the catalogue. It is a great honor for us to bring this unique ensemble to the market. The auction will take place in Paris on Wednesday 27 June at 4PM; below the preview dates. Don’t hesitate to get in touch if I can be of any service or if you want more information or images on a certain object. I hope to see you in Paris for this not-to-be-missed event! ps In order to comply with the General Data Protection Regulation (GDPR) coming into effect on May 25, 2018, I require your consent for me to get in touch via my newsletters. If you wish to continue receiving them you don’t have to do anything. You hereby authorize me to keep you informed about blog updates. If you wish to unsubscribe and stop receiving my news letters, please let me know – thanks. This entry was posted in Auctions, Collectors, News and tagged Mbembe on May 24, 2018 by admin.